The Temple Institute (in Hebrew, Machon HaMikdash), founded in 1987, is a non-profit educational and religious organization located in the Jewish quarter of Jerusalem’s Old City. We are dedicated to every aspect of the Biblical commandment to build the Holy Temple of G-d on Mount Moriah in Jerusalem. Our short-term goal is to rekindle the flame of the Holy Temple in the hearts of mankind. Our long-term goal is to do as much as possible to bring about the building of the Holy Temple in our time. Thus, the Institute’s efforts include raising public awareness about the Holy Temple, and the central role that it occupies in the spiritual life of mankind. The many areas of activities conducted by the Institute combine research, publications, and conferences, as well as the production of educational materials. The major focus of the Institute is its efforts towards the beginning of the actual rebuilding of the Holy Temple. Towards this end, the Institute has begun to restore and construct the sacred vessels for the service of the Holy Temple. These vessels, which G-d commanded Israel to create, can be seen today at our headquarters in Jerusalem. They are made according to the exact specifications of the Bible, and have been constructed from the original source materials, such as gold, copper, silver and wood. These are authentic, accurate vessels, not merely replicas or models. All of these items are fit and ready for use in the service of the Holy Temple. Among the many items featured in the exhibition are musical instruments played by the Levitical choir, the golden crown of the High Priest, and gold and silver vessels used in the incense and sacrificial services. After many years of effort and toil, the Institute has just recently completed the three most important and central vessels of the Divine service: the seven-branched candelabra, or Menorah, made of pure gold; the golden Incense Altar, and the golden Table of the Showbread. 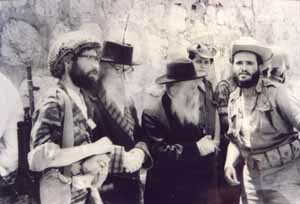 Rabbi Yisrael Ariel (left), the Institute’s founder, serves as its head. Rabbi Menachem Makover is the Director General. Rabbi Chaim Richman directs all English-language and international projects. The Temple Institute’s traveling educational bureau. The Academy lectures to audiences of all ages and backgrounds in Israel and abroad. Using numerous creative methods, the Academy’s presentations portray life in Temple times. The restored Temple vessels, pending service in the rebuilt Holy Temple, may be viewed by the public at our headquarters in Jerusalem. Since 1989, over 100,000 visitors from all over the world have visited the Institute each year. Through the renewal of these sacred vessels, some of the light of the Holy Temple has begun to return. See contact information (below) for tour details, scheduling and directions. Specializing in publications, visual aids and educational materials that bring the world of the Holy Temple to life. Educating a new generation of artists, musicians and traditional Jewish artisans in the Temple spirit. A seminary for advanced study and training in all subjects relating to the Holy Temple. The Bible teaches us that the Holy Temple was the center of mankind’s spiritual relationship with G-d. The prophets of Israel all foresaw that the day will come when the Holy Temple will be rebuilt, and will once again be the spiritual focus of the entire world. As Isaiah states, "For My house shall be called a house of prayer for all people." From the Western Wall plaza, walk up the stairs leading to the Jewish Quarter. (When you walk away from the Wall, the stairs are located diagonally to the left). The first street you will come to at the top of the stairs is Misgav Ladach Street. Turn right (past the cafe) and look for our sign, "Treasures of the Temple." (Note: if you take the stairs that are located directly in back of the Wall, next to the police station, then you will be making a left at the top of the stairs). Walk through the parking lot, passing the Sephardic Center on your right. Walk to the central square of the Jewish Quarter. Cross the square diagonally, passing the bank on your left. Continue walking down Tiferet Yisrael Street, passing the Bagel Shop on your right. At the cafe on the corner (at the end of the street), turn left. This is Misgav Ladach Street…look for the sign, "Treasures of the Temple." The Institute’s exhibition halls are open to the public Sunday-Thursday from 9:00 AM till 5:00 PM, and Fridays from 9:00 AM – 1:00 PM. To all Friends of Israel! The time to make a clear statement on behalf of the G-d of Israel and the Holy Temple is at hand! On behalf of the Temple Institute, we turn to you from Jerusalem, the place G-d has chosen, with a request that you be numbered among the supporters of our holy work, and thus ensure that the vision of the Holy Temple, the center of mankind’s relationship with G-d, can become a reality in our time. The prophets of Israel all foresaw that the day will come when the Holy Temple will be rebuilt, and will once again be the spiritual focus of the entire world. As Isaiah states, "For My house shall be called a house of prayer for all nations." As you are well aware, these are days of trouble for Israel—days of severe tests, many of which relate directly to the place of our Holy Temple. The Moslem Wakf, no longer satisfied with merely destroying remnants from the Holy Temple, have embarked upon the next stage of their campaign. Having seen that none arose to stop them, they are now planning on constructing another mosque on the site of the Holy Temple, in order to permanently change the status of the Mountain…and the status of Jerusalem. Once again, we are witnessing the destruction of the Holy Temple. Do you realize that Jerusalem was never the capital of any people in the world, other than the Jewish people? And never an Arab capital? The same word "Jerusalem" which appears in the Bible over 700 times, does not appear in the Koran even once. And yet today, the Higher Islamic Commission of Jerusalem declared that "there will be no peace or stability in the region or the world without the return of occupied Jerusalem as an Arab and Islamic capital of the sacred Palestinian state." Their declaration stated that Christian occupation of Christian holy places in Jerusalem must end as well. Arafat will not relinquish control over the Temple Mount; furthermore, the Mufti of Jerusalem, Sheikh Sabri, who denies that the Holy Temple ever existed, added "we will not allow the false claims by the Jews to pass." At the Temple Institute, we respond to this challenge with mammoth efforts to stem the tide of desecration. With thanks to G-d, the Institute continues to make great strides forward in Temple development, research, awareness, and physical preparation. In this past year, the Temple Institute has reached an important milestone: We have completed the three most central vessels for Temple service. The golden Menorah, the Incense Altar, and the Table of the Showbread have been completed in all their glory and magnificence, and these vessels are now ready to take their place in the soon-to-be-rebuilt Holy Temple. For the first time since the Holy Temple was destroyed nearly 2,000 years ago, the people of Israel are within reach of Temple service. But even now, the mindless, mad rush towards "peace" – which would come at the cost of Israel’s destruction – continues. The very survival of the Jewish people is at stake, as our morally bereft leadership continues along a path of self-destruction, and promises our precious homeland to the avowed enemy of the Jewish people in exchange for empty promises of a false "peace"…even as the Palestinians are preparing for war and mayhem. In these days especially, it is fitting to arouse our hearts and hopes towards the desire for our Holy Temple. Here at the Temple Institute, every contribution helps advance our ability to raise up the Holy Temple from destruction to renewal. Your financial support is greatly appreciated and is needed more than ever. Each contribution brings us one step closer to the rebuilding of the Holy Temple. If you feel that you are called of G-d, your part in the rebuilding of the Holy Temple is indeed very important. Your dedication can earn you a share in everything that we are able to accomplish towards the rebuilding of the Holy Temple—may it be soon, with G-d’s help. While darkness seems to reign on the one hand, on the other hand, the Holy Temple gradually is being rebuilt, and activism on its behalf continues to grow. We are certain that the day when the redemption will be complete and when G-d’s House will be reestablished in Jerusalem, is not far off. These are the days of the struggle for Jerusalem, the days that the prophets saw coming, when Jerusalem would become the "troublesome stone" and the "cup of trembling." We invite you to make your voice heard, and help to defeat Israel’s enemies…the same enemies who deny that the G-d of Israel chose Jerusalem, and swore to return His Presence to the holy city. Come and take a stand for the side of right—take a stand for Jerusalem! Rabbi Richman's US Lecture Schedule. Web site design & artwork copyright ©2000-2003, Electric Scribe (SM).